With Xojo running with a new Web project, we will start adding a couple of styles (WebStyle) to the project from the Library. Select the first of the just added styles in order to access the Styles Editor and change the Name property to MenuStyle in the Inspector. 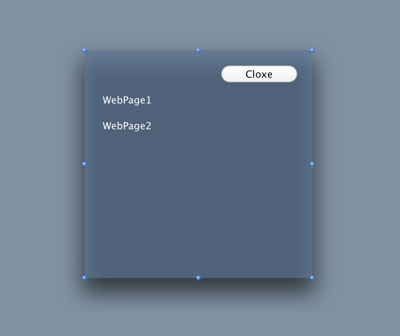 Now, add the Background property using the Style editor and set the background color to the one you want to use. Maybe you want to set the Opacity property so it is not 100% solid when the menu is displayed over the webpages. Choose the second style in the Navigator and change its Name property to TextWhite (or other name of your election) in the Inspector, setting the Text Color property to the one you want (white in the example). This is the style to be applied on the WebLabel controls of the menu. Add now a WebContainer from the Library to the Navigator. This is the control that will include all the links to the webpages of the web app; and also will contain the button responsible of closing the menu using a sliding animation on the right side of the webpage. Of course, you can easily change these UI controls to other ones that fits better in your app design. 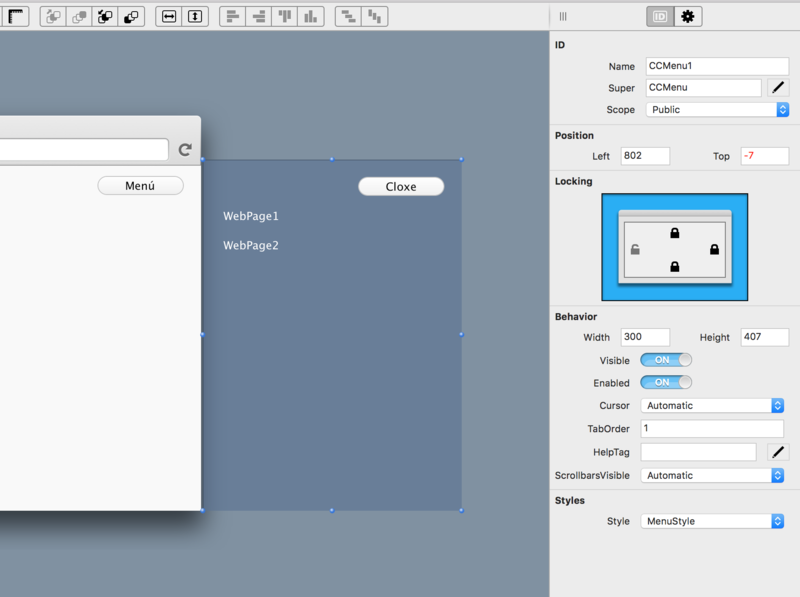 You don’t need to modify the size of the control; this is something we will set using the control locking options in the Inspector once we add it to our template webpage. The next control that we add to the WebContainer is the button that will hide the menu, and also the WebLabels that will link to the webpages we want to drive from the menu. Don’t forget to set the property Style to TextWhite (or the name set in the previous step) to the WebLabels using the Inspector. That is, it will call the previously created private method passing along the True value, so it will instruct to display the menu. That is, when the web app user clicks the button it will call the method in charge of hiding the Menu. Now we have everything we need for our example menu. Now it is time to add the webpage acting as a template for all the app webpages subclassed from it using the menu. Notice the Locking values for the added WebContainer displayed in the Inspector on the screenshot, so it is locked to the same width and height of the webpage when we run the app. As you can see, this simply calls the public show method previously added to the CCMenu WebContainer, so it displays the menu. This is everything we need to do. We have mainly everything we need to run our example. We just need to add a couple of additional webpages to the project from the Library. Change its names to WebPage1 and WebPage2, because this is the property whose value has to match with the text of the labels added to the menu, in order to show the right page from the menu. The main point here is set the Super property for both webpages to WPBase, so they inherit all the elements from the template webpage created in the previous step. Finally, add any controls you want to each webpage simply so you can distinguish one from other when selected from the menu. Click the Run button in the Xojo IDE toolbar and test the menu! You can download and play with the project this tutorial is based on from this link.